One of the best opportunities for physical activity is your commute to work. If you live close enough, try walking or biking to work instead of taking the car or public transportation. Inside the office building, avoid viewing the stairs as an alternative escape route in an emergency. Instead, make it a point to use the stairs every day, even if only for a few floors. According to Cedric Bryant, chief science officer for the American Council on Exercise, using the stairs has a relatively low impact on the feet, knees and joints. As you adapt, try taking them up and down multiple times during your lunch hour, or consider taking two at a time for an extra challenge. A body at rest tends to stay at rest – sitting burns few calories and does little for the metabolism. 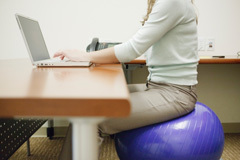 Another office workout can be as simple as ditching your chair and standing. Doing so could burn an extra 200 calories per day, which can equal 14 pounds of weight loss per year. If you cannot acquire a standing-height level desk and must sit instead of standing, try using a stability ball instead of a desk chair. Sitting on a stability ball forces you to engage your core muscles, which helps tone muscles and burn fat. Download a free app that has 10-minute workouts you can complete on your work break. Store a yoga mat and some free weights in your office to facilitate your workouts. If you do not have space at work to exercise, try strapping runner’s weights to your ankles or wrists. You’ll expend more calories performing day-to-day work activities without requiring more space or time. What’s your favorite office workout? Share with us the things that you do to stay fit at work. Use the “Comments” section below.